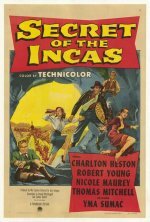 Charlton Heston and Thomas Mitchell play the rivals engaged in a perilous search for a fabled Inca icon in this adventure yarn from director Jerry Hopper. There's romance and Cold War intrigue, so fashionable in 1954, but what distinguishes the film are the location shots of the fabled Inca city of Machu Picchu, which sits swathed in Andean clouds, and nowadays heaves with tourists on day trips from crime-ridden Cuzco. Machu Picchu was discovered in 1911 by an American adventurer-archaeologist named Hiram Bingham, who was the inspiration for Steven Spielberg's whip-wielding hero Indiana Jones.